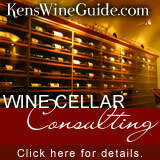 On Friday, November 16th the KensWineGuide.com Tasting Panel covered 13 wines ranging from $85 to $245. Below is a video of the Top 9 winning bottles in order from lowest score of 91 to the highest score of 93.2. Below is a list of the Top 9 Winning Wines. We hope you enjoy them as much as we did! Also – If you would like to see all of our High End Recommendations – Check out our Collectible Wines page!